Liberec (Czech: [ˈlɪbɛrɛts] ( listen); German: Reichenberg [ˈʁaɪçn̩bɛɐ̯k]) is a city in the Czech Republic. It is on the Lusatian Neisse and surrounded by the Jizera Mountains and Ještěd-Kozákov Ridge. It is the fifth-largest city in the Czech Republic. Liberec was once home to a thriving textile industry and hence nicknamed the "Manchester of Bohemia". For many Czechs, Liberec is mostly associated with the city's dominant Ještěd Tower. Since the end of the 19th century, the city has been a conurbation with the suburb of Vratislavice and the neighboring town of Jablonec nad Nisou. Therefore, the total area with suburbs encompasses 150,000 inhabitants. That makes Liberec the third-largest city, including the suburbs, in Bohemia after Prague and Plzeň. Probably at the end of the 13th century, a settlement was established on the trade route from Bohemia to Lusatia. Liberec first belonged to the Bieberstein and Redern families and was first mentioned in a document of 1348. When Redern family after the Battle of White Mountain was forced to leave Liberec, it was acquired to the possessions of Albrecht von Wallenstein. After his death it belonged to the Gallas and Clam Gallas families. The cloth-making industry was introduced in 1579. The prosperous local industry was interrupted by the Thirty Years' War and a great plague in the 1680s. The Battle of Reichenberg between Austria and Prussia occurred nearby in 1757 during the Seven Years' War. 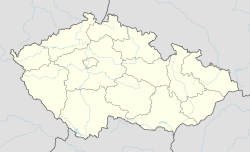 Until 1918 the town was part of the Kingdom of Bohemia, Austrian monarchy (Austrian side after the compromise of 1867), seat of the Reichenberg district, one of the 94 Bezirkshauptmannschaften in Bohemia. At one time the second city of Bohemia, the city developed rapidly at the end of the 19th century and as a result has a spectacular collection of late-19th-century buildings; the town hall, the opera house and the Severočeské Muzeum (North Bohemian Museum) are of note. The Opera House has a spectacular main curtain designed by the Austrian artist Gustav Klimt. The neighbourhoods on the hills above the town centre display beautiful homes and streets, laid out in a picturesque Romantic style similar to some central European thermal spas. After the end of World War I Austria-Hungary fell apart. The Czechs of Bohemia joined newly established Czechoslovakia on 29 October 1918 whilst the Germans wanted to create independent German Austria on 12 November 1918, both citing Woodrow Wilson's Fourteen Points and the doctrine of self-determination. Reichenberg was declared the capital of the German-Austrian province of German Bohemia. However, as these lands were historically an integral part of the Duchy and Kingdom of Bohemia, on 16 December 1918 the Czechoslovak Army entered Reichenberg and the whole province and both remained part of Czechoslovakia. In the 1920s and the 1930s, Liberec became the unofficial capital of Germans in Czechoslovakia, a position was underlined by the foundation of important institutions such as Bücherei der Deutschen, a central German library in Czechoslovaki, and by failed efforts to relocate the German (Charles) University there from Prague. The Great Depression devastated the economy of the area with its textile, carpet, glass and other light industry. The high number of unemployed people, hunger, fear of the future and dissatisfaction with the Prague government led to the flash rise of the populist Sudeten German Party (SdP), founded by Konrad Henlein, born in the suburbs of Liberec. Whilst he declared fidelity to the Republic, he secretly negotiated with Adolf Hitler. In 1937 he radicalized his views and became Hitler's puppet in order to incorporate the Sudetenland into Germany and destabilize Czechoslovakia, which was an ally of France and one of the leading arms producers in Europe. The city became the centre of Pan-German movements and later of the Nazis, especially after the 1935 election, despite its important democratic mayor, Karl Kostka (German Democratic Freedom Party). The final change came in Summer 1938, after the radicalization of the terror of the SdP, whose death threats forced Kostka and his family to flee to Prague. In September 1938, after two unsuccessful attempts by the SdP to stage a pro-Nazi coup in Czechoslovakia, which were stopped by police and the army, the Munich Agreement awarded the city to Nazi Germany and it became the capital of the Sudetengau region. Most of the city's Jewish and Czech population fled to the rest of Czechoslovakia or were expelled. The important synagogue was burned down. During a rally in December 1938, Hitler laid out the future of the Hitler Youth. After World War II the town again became a part of Czechoslovakia and nearly all of the city's German population was expelled following the Beneš decrees. The region was then resettled with Czechs, completely altering the traditional language and culture of the town and its region. The city continues to have an important German minority, consisting of descendants of anti-Nazi Germans who were active in the struggle against Hitler, as well as Germans from Czech-German families and their descendants. Liberec also has a Jewish minority with a newly built synagogue and a Greek minority, originating from Communist refugees who settled there after the Greek Civil War in 1949. The origin of the city name was the subject of many discussions, often nationally influenced, because it was a bilingual settlement. The oldest known names of the city are German, Reychinberch (1352) and Raichmberg (1369), meaning "rich/resourceful mountain" (reicher Berg in modern German). It was also named Reichenberg (1385) and Rychmberg (1410). The Czech equivalent originated as a distortion: Rychberk (1545), Lychberk (1592), Libercum (1634), Liberk (1790), and finally Liberec (1845). In Czech, words starting with "R" were often dissimilated into "L". Since then, the city was known as Liberec in Czech and as Reichenberg in German (changing to Liberec after World War II). Hablau, the name of the old street near city center, is considered to be a trace of the old village possibly founded by Havel of Lemberk, husband of Saint Zdislava Berka. Technical University of Liberec (Technická Univerzita v Liberci): Founded in 1953 as a Technical College. In 1995 gained the status of a university. It has about 10,000 students in 6 schools (Mechanical Engineering, Textile Engineering, Architecture, Mechatronics, Humanities and Nature and Economics). Applied research in mechatronics, important school of architecture. Regional Science Library (Krajská vědecká knihovna): A general public science library, aiming at general education in the region. Founded in 1923 as a new umbrella library Buecherei der Deutschen. New building was completed in 2000. It has an exceptional collection of Germano-Slavica and Sudetica (periodicals and books in German language from Bohemia). Its building comprises also a modern synagogue. The North Bohemian Museum (Severočeské muzeum): Built in 1873. It ranks among the oldest and most significant museums of nature sciences, arts and crafts in the Czech Republic. There is the sculpture of T.G. Masaryk from 2010 standing in front of the Museum. The zoo in Liberec was the first to be opened in Czechoslovakia in 1919. The zoo contains a wide variety of fauna (about 143 species on 13 ha), including large mammals like elephants, giraffes, sea lions and white tigers, which are a genetic anomaly and hence very rare. It participates in breeding activities of endangered species to help preserve the gene pool. The Botanical Garden in Liberec (completely rebuilt from Kučera 1995 to 2000) comprises nine glasshouses for visitors (with a total area of 3,000 m2 (32,291.73 sq ft) and 13 exhibition themes), nine plantation glasshouses and a large exterior terrain. It continues the legacy of a botanical garden established in 1876 by the Verein der Naturfreunde ("Society of Friends of Nature") on a nearby site and it is therefore considered the oldest one in the Czech Republic. Liberec city transport provides bus and tram lines. The first tram was used in Liberec in 1897. Liberec shares the narrow gauge tramway line which connects it to its neighboring city, Jablonec nad Nisou which is 12 km away. There are also two city lines with standard gauge: The first connects Horní Hanychov (not far to the cable car to Ještěd) and Lidové Sady via Fügnerova. The second connects Dolní Hanychov and Lidové Sady via Fügnerova (only during workdays). There also four historical trams. In the city centre there are two tracks as a memorial, in the past trams were used also on the central place in front of town hall. A private international airport is located 2,5 km from Liberec, at the nearby village of Ostašov. The city is home to FC Slovan Liberec, a football club founded in Liberec and currently playing the Gambrinus liga, the highest division of Czech football. Slovan Liberec is one of the most successful clubs in the Czech Republic, having won three league titles. There is also SK VTJ Rapid Liberec. It is playing one of the lowest division. Ice hockey team HC Bílí Tygři Liberec play in the Czech Extraliga, the highest national ice hockey league. Last season they won national hockey league. They are champions. Liberec has hosted two European Luge Championships, having done so in 1914 and 1939. In 2009, it hosted the FIS Nordic World Ski Championships. The Ski Jumping World Cup always comes to Liberec in January. The World Karate Championships took place in May 2011. In 2015, from 15 August to 23 August, Liberec plays host to the 2015 World Mountain Bike Orienteering Championships (WMTBOC). Wikimedia Commons has media related to Liberec.